Thurleigh was then handed over to the United States Eighth Army Air Force [USAAF] as "Station 111". In September 1942 personnel of the 306th Bombardment Group moved in and for the next three years, until the cessation of hostilities, the airfield housed four squadrons of Boeing B17s [Flying Fortresses]: the 367th, "Clay Pigeons"; 368th, "Eager Beavers"; 369th, Fitin Bitin and the 423rd, "Grim Reapers" Of the order of 80 aircraft were resident on the field at any one time and an average of some 30 aircraft were despatched on each of the 341 bombing missions flown over the period October 1942 to April 1945. The first USAAF raid over German territory, led by the 306th, took place on 27 January 1943 with an attack on Wilhelmshaven, hence the motto of the group became "First Over Germany". Departing Thurleigh in Autumn 1945, 177 aircraft had been lost, 738 men killed and 885 taken prisoners of war. A memorial to those who served stands proudly in Thurleigh village. While the B17s were flying over Germany, ultimate victory appeared likely and thoughts began to turn towards post-war recovery and prosperity. Aviation was seen to offer great commercial and technological opportunity but would require investment in extensive new research facilities. Powerful wind tunnels were built on a site above the village of Milton Ernest to meet the challenge of supersonic flight and with the acquisition of additional land to the east, a custom-built flight-test facility was superimposed on the existing war-time Thurleigh airfield. This meant demolishing or moving many buildings and the two "hangars" in use on the Bedford Autodrome site are both of 1941 vintage. New runways were constructed, the main one measuring 3,400 metres long by 97 metres wide. Flying re-commenced in 1954 and research at Thurleigh led world aviation development in many areas including: aircraft control and handling; supersonic transport development (Concorde); civil and military automatic blind landing; all-weather operations; approach and landing aids; air traffic management; military vertical take-off and landing [Harrier]; and launch and recovery of aircraft for naval operations. The research phase of the airfield's life ceased in 1994 when all Government test flying was centred at Boscombe Down. 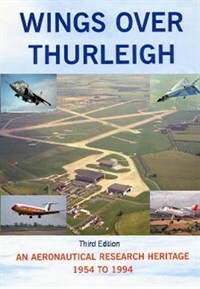 Since 1994 occasional aircraft have landed on the eastern runway section on a casual basis, but in 2010, seventy years after the original conception, Thurleigh was re-licensed by the CAA for flying operations as "Bedford Aerodrome", thereby beginning a new chapter in the illustrious history of this very distinguished airfield. All revenue from sales goes to support the work of the Bedford Aeronautical Heritage Group. This Group is dedicated to recording for posterity the heritage of the Royal Aircraft Establishment Bedford through the retention and preservation of paper and photographic material and other artefacts from that historic period. Price £15.00 plus UK postage and packing £6.00.